The Type-46 Infantry Support Vehicle (T46 ISV), commonly known as the Spectre, is a Covenant anti-infantry and transportation vehicle. Like most Covenant vehicles, the T46 ISV utilizes a pair of boosted gravity propulsion drives for locomotion and features a sleek, bulbous design. The driver is seated in a lightly armored station at the front of the vehicle; a hatch provides limited protection to the driver's left and right sides, though the front is almost completely exposed. A single anti-gravity generator is mounted on either side of the vehicle behind the driver. A single-passenger seat is mounted above each anti-gravity generator, allowing two passengers to provide fire support. It is quite transportable and can be easily carried by a Type-52 Phantom. The Spectre possesses impressive lateral maneuverability: it is able to strafe left and right at almost full speed, which is one of its main advantages over the Prowler. The main thruster can be accelerated indefinitely, greatly increasing the vehicle's speed at a great cost of maneuverability. The Spectre's main armament is a Class-1 light plasma cannon, mounted on a turret above the forward thruster at the rear of the vehicle. This weapon possesses a very high rate of fire, though the bolts often ricochet off targets. The turret can rotate 360 degrees and has a large angle of vertical inclination, allowing it to fire on targets at higher elevation, including low-flying aircraft. The Spectre was first encountered by United Nations Space Command personnel during the Battle of Sargasso in 2546. The Spectre was used by the Covenant to fill a role between that of the Type-32 Ghost, a rapid assault vehicle, and that of the Type-26 Wraith, a heavy support tank. 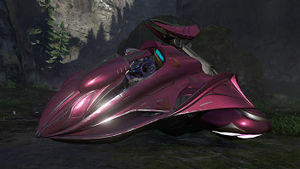 The Spectre competed in this regard with the relatively uncommon Type-52 Prowler, which was utilized exclusively by the Jiralhanae, though neither held popular favor; eventually, both were largely supplanted by the Type-48 Revenant. Spectres were used by the Covenant during the Fall of Arcadia. During the Battle of Installation 05, a Spectre along with several Ghosts were deployed by a Phantom to support Arbiter Thel 'Vadamee and a unit of Special Operations Sangheili in order to support their push through the Flood-infested Quarantine Zone towards the Library. Shortly after emerging from a downed Sentinel manufacturing facility, 'Vadamee regrouped with Special Operations Commander Rtas 'Vadum and another Sangheili piloting another Spectre. Later in the battle, following the outbreak of the Great Schism, Jiralhanae forces deployed to the surface of Installation 05 utilized at least one Spectre during their attacks against the Sangheili. Another was used by Thel 'Vadam during his assault on the Bastion of the Brutes and several more Jiralhanae-operated Spectres were among the forces that vainly attempted to prevent 'Vadam and Sergeant Johnson from reaching the installation's Control Room. In the following weeks, the Spectre was entirely replaced by the Type-52 Prowler which was being mass-produced by then. After the war, some independent Sangheili keeps on Sanghelios kept Spectres and used them at the outset of the Blooding Years. In 2558, a Kig-Yar pirate queen on Ven III also had a number of Spectres, one of which was used against her forces when it was comandeered by Spartan Naiya Ray. On the planet Carrow in a Joint Occupation Zone, Sangheili under the direction of Rojka 'Kasaan demilitarized many Spectres as a gesture of peace toward humans, but by July of 2558 many had also been rearmed by followers of Thars. The Spectre has a stable firing platform thanks to its flat and heavy design and evenly-placed propulsion drive. Its plasma turret is very accurate and has a high rate of fire, delivering a reasonable amount of damage to its target; it is ideal for taking down Banshees, and can be used with success against infantry. It is capable of carrying a gunner and two passengers in addition to the driver. One of many disadvantages of the Spectre is the high vulnerability of its passengers to attacks. While the driver's seat is protected by the vehicle's hull, the passengers are an open target to small arms fire and splash damage from nearby explosions. The gunner must also lead his targets when firing at medium to long range, as there is a noticeable travel time for the plasma projectiles. The Spectre first appeared in the pre-release version of Halo, though it was removed from Halo: Combat Evolved. If the player presses and holds A while driving, the air brake will engage. The front end will rise, enabling the player to climb some walls. A glitch occurs when two players in the passenger seats have Sentinel Beams. If one player fires their Sentinel Beam, then the other player's Sentinel Beam will appear to fire as well, though this will not drain the second player's battery, and will not increase the damage. If the second player fires their beam, the only effect on the target will be from them. Early concept art of the Spectre for Halo: Combat Evolved. Finalized concept art of the cut Spectre from Halo: Combat Evolved. The original Spectre present in the E3 2000 Trailer, at the time called the "Shadow". An overhead view of the Spectre. A angled view of the Spectre. A side view of the Spectre. A fully-manned Spectre in Halo 2. A Spectre mounted on a Phantom's undercarriage. HUD of the Spectre's turret in Halo 2. Naiya Ray in the cockpit of a Spectre. A turret-less Spectre inside Ven III's cave system. A turret-less Spectre traversing Ven III's caverns. Rear view of the turret-less Spectre. Another view of a turret-less Spectre. A Spectre in Halo 2: Anniversary. Rtas 'Vadum shooting the T-46 plasma cannon aboard a Spectre during the Battle of Installation 05. HUD of the Spectre in Halo 2: Anniversary. HUD of the Spectre's turret in Halo 2: Anniversary.